At the ripe old age of 100, the New England Museum Association (NEMA) seems to be going stronger than ever. That’s my impression, based on this year’s centennial conference in Stamford, Connecticut, attended by nearly 1000 people from the northeast region. This year’s theme, Museums on The Move, offered attendees a reflective look at the history of this organization, from its humble origins as a philanthropic project begun by Delia Griffin, founder of the Boston Children’s Museum, and a handful of colleagues, to its present status as one of the nation’s leading advocacy organizations for museums (www.nemanet.org). So, what’s changed since NEMA’s inception? This year’s conference featured for the first time TED-talk style “storytelling sessions,” presenting 20 minute case studies. 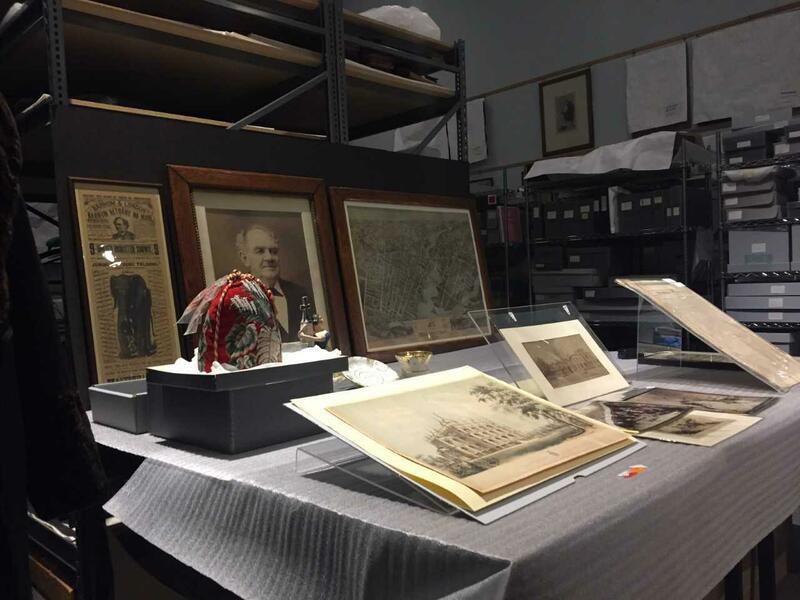 Also new was the “Collections Corps” service project, organized by the Registrar and Collections Care Specialists and Conservators PAGs, which assisted Connecticut’s Shelton Historical Society with a collections project. NEMA at 100 featured some new and unique presenters, too. Instead of the usual keynote address by a single individual, several speakers, representing a cross-section of disciplines and fields offered short reflections on a wide range of topics including “Art as Healing,” “Museums and Civic Dialogue,” “Diversity, Youth and Museums,” and “The Future of History.” These talks culminated in a multi-media performance by Kledia Spiro, who recounted her compelling personal and professional journey from war-torn Albania to becoming a competitive powerlifter and now an emerging professional at the Fitchburg Art Museum. Her performance was anything but traditional! So, what did I learn at NEMA? One of the biggest challenges at any conference is choosing what to attend. The NEMA conference offers many sessions specifically focused on career development, especially for emerging professionals. At the informal Independent Museum Professionals Affinity Group for established and emerging professionals, I learned about the challenges faced by independent museum contractors, including how to create an equitable project budget and fair price for contract labor. Uncovering Your Inner Compass, an interactive workshop focusing on discovering core values that help navigate our paths with purpose, took a more personal approach to career planning. This provided an opportunity to reexamine my motivations and core beliefs, as they relate to my academic and career goals. In a Career Conversation with Larry Yerdon, Executive Director of Strawberry Banke in Portsmouth NH shared his specific career path through a variety of cultural organizations. This helped me to better understand the real life journey of a museum executive, serving as a useful professional model. At the Newcomer’s Reception, a mix and mingle of young and emerging museum professionals, I met students and museum staff, with whom I discussed academic and career-related topics of mutual interest. NEMA at 100 also offered opportunities for guided experiences at local museums. Bridgeport’s P.T. Barnum Museum staff led a group tour of the exhibit The Real Deal: P.T. Barnum’s Legacy in Bridgeport. The exhibition revealed Barnum’s entrepreneurial career as an innovative museum proprietor and visionary big top circus promoter, who exhibited and represented some of the most fantastical and novel objects and people. However, we also learned that Barnum was not just an exploitive capitalist; he was also a progressive politician and ardent supporter of abolition and women’s rights, who worked for social change. Our visit included a special hardhat tour of the building badly damaged by a tornado, leading to an in depth discussion of the challenges of natural disaster planning and recovery for museums. We were also treated to a behind the scenes visit to the archives and collections, where the curator showed us a range of artifacts not on view to the public. 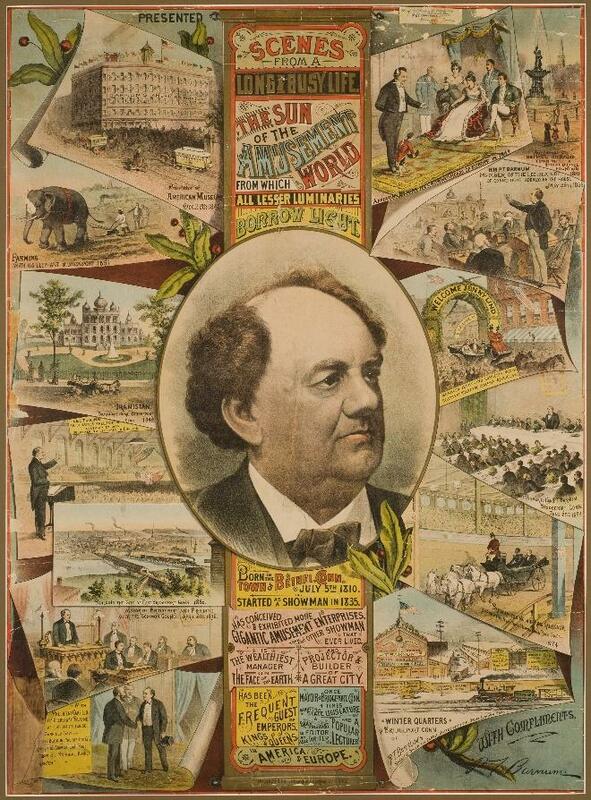 Full-color poster, “Scenes from a Long and Busy Life,” featuring a portrait of P. T. Barnum, surrounded by vignettes illustrating highlights of his life and career. Ca. 1881. Courtesy of the Barnum Museum. This image may not be reproduced in any form without written permission from the Barnum Museum. Scene from the NEMA tour of special collections held by the Barnum Museum, Bridgeport, CT. Courtesy of the Barnum Museum. This image may not be reproduced in any form without written permission from the Barnum Museum. Perhaps most importantly, I learned about recent community engagement and cultural preservation efforts in the museum community. The session Museums in Puerto Rico, focused on Hurricane Maria’s devastating impact on museums and socio-cultural institutions across the island in 2017. The panel was moderated by museum professionals working in Puerto Rico and the mainland at Museo de Arte Contemporaneo de Puerto Rico; Harvard Puerto Rico Winter Institute; The Metropolitan Museum of Art; Museo de Arte de Puerto Rico, and Boston Children’s Museum. This session presented current museum outreach and community engagement projects, post-hurricane recovery efforts by museums and their role in preserving cultural resources and identity. Professor Pedro Reina-Perez, professor of history at the University of Puerto Rico San Juan and the Harvard Puerto Rico Winter Institute, warned of the startling possibility that much of the island’s cultural patrimony could be lost, through a combination of natural disaster and the auction of university and museum collections to repay debts. He spoke about the importance of culture– “Culture equals identity. For colonial people culture is the most important thing.” This stark reality check was by far the most impactful moment of my NEMA experience. It also prompted me to speak with Professor Perez about ways that students and museum professionals might provide assistance or support to universities or cultural institutions on the island, and closer to home. As a father of a current UMass Boston undergrad, he was eager to engage in further discussion of how history students might help. I look forward to continuing this dialogue and hopefully connecting our communities in creative and compassionate ways. So, why should you go to NEMA? It’s a great opportunity to meet and engage with new and seasoned museum and history enthusiasts from around New England, share your stories and experiences and learn from others as a student and emerging professional. There are also a number of sources which can fund your NEMA conference professional development. For more information about NEMA scholarships: https://www.nemanet.org/conference-events/conference/2018-nema-conference/scholarships/.